Henry Hathaway’s (The Lives of a Bengal Lancer and True Grit) brooding actioner — a noir-western hybrid — not only has stunning vistas, courtesy of then-new CinemaScope process, but also honest emotions and thought-provoking ideas. Garden of Evil, intelligently written by Frank Fenton (These Wilder Years), and lavishly produced by Charles Brackett (The 39 Steps), presents an ugly vision of a world being besieged by greed and self-interest. The characters are interesting and they interact in the most fascinating ways. And the human drama is bathed in Bernard Herrmann’s (Vertigo) rousing music score — it’s one of his best scores. I like the older Gary Cooper. I think he got better with age — the handsome face was replaced by maturity and depth. Cooper’s philosophical stranger contrasts beautifully with Susan Hayward’s quasi-femme-fatale. Gosh, I love the lady! She could handle anything that man, beast or God could dish out. Hayward is so tough than even Cooper seems to be afraid of her! Richard Widmark’s cynical card player adds another interesting layer to the story. Even lightweight Hugh Marlowe is effective as Hayward’s husband. Rita Moreno (West Side Story) has a small role as a local saloon girl. Filmed on location (Paricutín Volcano, Michoacán, Mexico) by Milton Krasner (Three Coins in the Fountain and An Affair to Remember) and Jorge Stahl Jr., with superb matte work by Ray Kellogg (The Egyptian and Demetrius and the Gladiators). 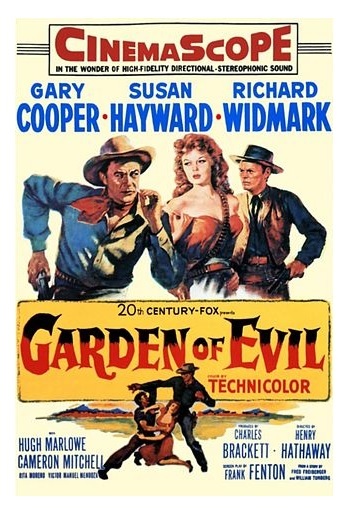 Garden of Evil is a fine example of the kind of “psychological western” that flourished in the 1950s. It’s a superb western, full of action and suspense; a thinking person’s adventure tale. Color, 96 minutes, Not Rated. A fine movie- well cast and well directed too. Hathaway was an extraordinarily versatile director, turning out superbly crafted pictures in every genre. And I agree the score and cinematography are very fine. Agreed. Hathaway made different kinds of movies, most of them are really good.